Chlorella and spirulina are both nutritional powerhouses. They are true superfoods, quite literally ruling the plant kingdom, with their abundant health benefits. Both chlorella and spirulina are micro-algae, and have numerous similar health benefits – could be why they are often thought of as being one and the same. Which they are not. Similar, yes. The same, no. Chlorella is spherical shaped algae, and is solid green in color, owing to its high chlorophyll concentration. Spirulina, on the other hand, is spiral in shape (hence, spirulina), and is blue-green in color. Chlorella is a single-cell microorganism with a nucleus, whereas spirulina is a multi-cell microorganism, with no real nucleus. Besides, if you compare chlorella vs spirulina with regard to faster cell regeneration, then chlorella gains the upper hand, despite being a single-cell organism. With its CGF, or Chlorella Growth Factor, it grows much faster than spirulina. While both chlorella and spirulina are nutrient-dense superfoods, each one has its own special positives. Chlorella boasts of more chlorophyll, iron and CGF. Chlorophyll is a mighty antioxidant that very efficiently rids harmful toxins from your body. CGF proves especially useful for those suffering from degenerative nerve or brain disorders, and also for sportspersons who can recover faster from any injuries, or muscle wear and tear. Spirulina, on the other hand, is a has more complete protein, more gamma linoleic acid (GLA), and is a better source of vitamin B12. GLA is a good fatty acid that aids to maintain better heart health and a sharper mind. Spirulina also has higher levels of phycocyanin, a rare antioxidant that can help avert cancer, and also lends it its bluish tint. If you compare the cultivation of chlorella vs spirulina, then growing spirulina is easier than growing chlorella. Both chlorella and spirulina are fresh water algae. Typically, most natural water bodies where spirulina thrives, host only very few other organisms. This makes it easier to harvest spirulina. Chlorella, on the other hand, owing to its microscopic size typically occupies the water bodies with other organisms, consequently making it way more difficult to harvest it. Another factor that makes it more difficult to process chlorella is its indigestible cell wall. To make it fit for human consumption, a complex (and expensive) process is needed to break the cell wall. In comparison, spirulina is directly ready for consumption and needs no cell wall processing since it has a completely digestible cell wall. 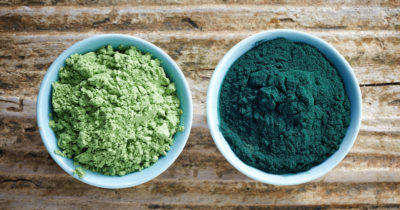 Chlorella vs spirulina – winner? Both chlorella and spirulina are super nutritious and have phenomenal health benefits. But if you insist on who ultimately wins the chlorella vs spirulina battle, then the choice depends on what your health priorities are. If you are keener on strengthening your immune system, or just detoxifying your body, perhaps chlorella would be a better option. If you want to detox, and get more vitamins and protein, then you could go for spirulina. If you ask me, a combination of both would be the best. Check out our top chlorella picks here. You may also be interested these spirulina suggestions from whatisspirulina.org.